Slightly used. Authentic Rayban Aviator Classic. Large. Excellent condition. Authentic Rayban Aviator Flash Lens. Gold frame. Excellent condition. Authentic Rayban Aviator Large Black/ Gold frame. Excellent condition. Authentic Rayban Aviator Large Sunglasses Black/ Silver frame. Unused. Authentic Rayban Aviator Sunglasses Large Black lens/ Silver frame. Excellent condition. Authentic Rayban Aviator Sunglasses Large Black/ Gold frame. Excellent condition. Authentic Rayban CATS 5000 Classic Tortoise Sunglasses BR4125. Barely used. 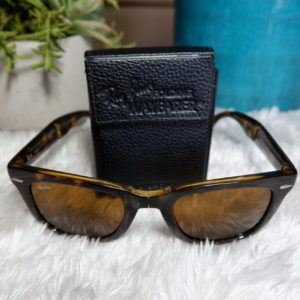 Authentic Rayban New Wayfarer Red Frame/ Brown lens.